Facebook’s recent courtship of publishers – like its attempt to move them onto Instant Articles, paying them to produce Facebook Live videos and allowing the posting of sponsored posts on their feeds – hasn’t insulated publishers from Facebook’s algorithm adjustments. On Wednesday, Facebook said it will change its algorithm to focus its news feed on friends and family posts. That includes articles friends share, but it will reduce the amount of posts from publishers that users follow. While Facebook users still want publisher content, they also want different types or amounts. 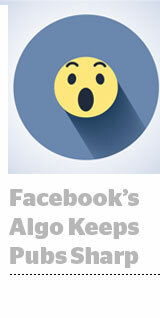 All publishers AdExchanger interviewed were confident their content would perform well despite Facebook’s algorithm change. The biggest risk is that reach for co-branded posts will decline, since advertisers like the higher distribution they get by piggybacking on publisher feeds. LittleThings revenue VP Justin Festa said many publishers see fewer interactions on co-branded posts. “If that continues to be the case, this algorithm change will impact those posts even more,” he said. A decline in organic reach may push publishers to pay to boost those posts. Outside of branded posts, publishers were confident that their content would still receive generous distribution on the platform. LittleThings says its inspirational content may benefit from the changes. “We think that because we produce uplifting, shareable content that people want to see, every time a change like this happens we don’t see the negative effects that other people see,” Festa said. Publishers doing well already – BuzzFeed and its ilk, for example – likely will continue to see strong results, predicted Lorenzo Thione, founder of The Social Edge, which helps celebrities like George Takei monetize and optimize their Facebook feeds by distributing publishers’ content. “If your social media strategy needs a major lift in light of these changes, you didn't have the right one to begin with,” he said.